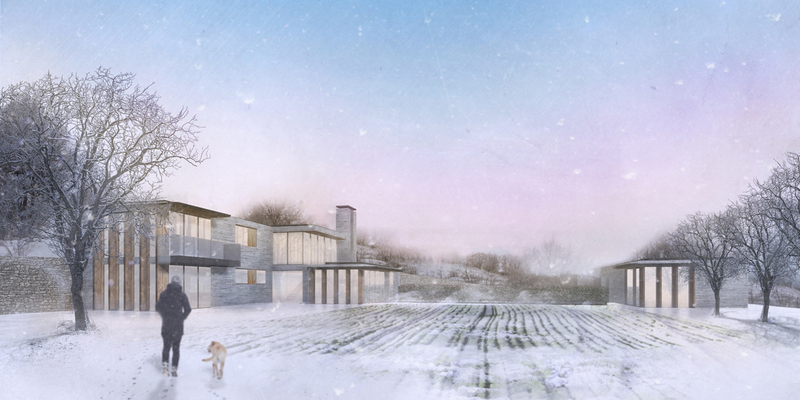 The design proposal is for a new family house positioned at the base of a steeply sloping wooded location on the site of a previous ‘manège’. The brief was to create a contemporary four bedroom home with guest accommodation. 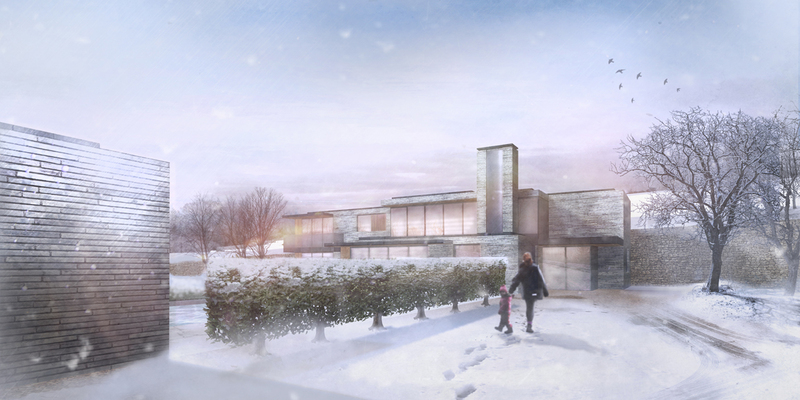 Our design response was to provide a principle volume to house the main family accommodation with a separate ‘baby brother’ pavilion for guests. 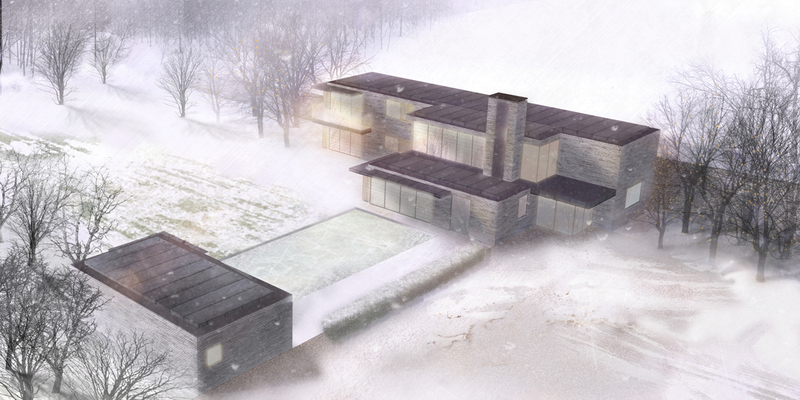 The two discrete buildings are proposed to be the anchor points for a formal linked, landscaped arrangement of shallow reflecting pool, linear hedging, paving and gardens. Public and private realms are deliberately segregated whilst allowing glimpses both through and between. The manège area provides the plateau for the buildings and their immediate surrounding landscaping, with the sloping land extending to the rear. The lower storey of the two storey house would be partially built into the gradient in order to bed the building into its environment. 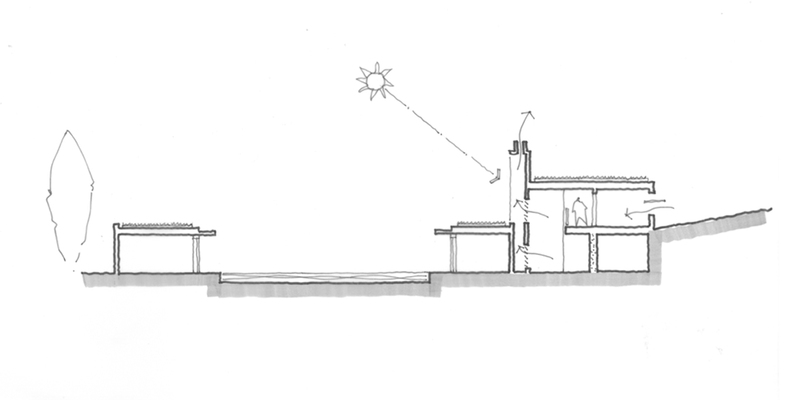 The house is designed to work in harmony with its location and to engage with passive forms of energy saving. The principle façade is south facing to maximise solar gain in the winter months, protection during the summer provided by deeply overhanging eaves, and vertical fins to control evening sunshine. The design features a passive solar chimney to promote natural cooling and cross ventilation effects, drawing fresh air in from the rear. Walling elements with an exposed high thermal mass are employed to extract and store daytime heat energy, allowing this to be slowly released throughout the cooler night time, to even out peak and trough temperature differences. Biodiversity and rainwater drainage management are encouraged by the inclusion of sedum-planted ‘green’ roof coverings. Extensive tree planting, including the creation of an orchard, is proposed.